Home/Graduate Updates/I Have an Idea! In our missionary-minded churches, many children feel called to be missionaries. Some may be drawn by the adventure of missions, others may feel sorry for the poor, hungry children in other countries; no doubt, some genuinely love God and want to do His will. As these children grow into adolescence, they should become more serious and mature in their dedication to Christ and His great commission; sadly this is rarely the case. Many allurements such as boyfriends and girlfriends, cars, jobs, education, etc. become more important than lost souls on the mission field. Often the call to missions is not nurtured by parents, peers, or pastors. God gave Michele Bass a burden for missions at a young age; her godly parents and church encouraged it, and as she matured, the desire to be a missionary increased. Growing up, she had access to good missionary books, and the Bass home was always open to visiting missionaries. Michele heard of Baptist Bible Translators Institute at age fifteen and knew she wanted to attend. In the Lord’s good timing, she did attend and graduated in 2003. Upon graduation, she spent a month in the Huastecan Mountains of Mexico putting into practice the language and culture-learning skills she had learned. She improved her Spanish and learned much of the sound system of the Náhuatl Indian language. Later that year, Michele made a trip to Thailand and Mongolia. 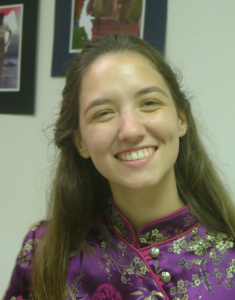 In the fall of 2004, Michele joined the BBTI staff and did an excellent job teaching Phonetics, Morphology/Syntax, and TEFL (Teaching English as a Foreign Language). I am convinced that she believes in the work of BBTI as much as any of us and has done her utmost to convince new missionaries to avail themselves of this training opportunity. She is constantly thinking of new ways to promote the school or improve it to more effectively train God’s servants. Numerous times she has said to me, “Brother Rex, I have an idea!” I may jokingly say, “Oh no, what is it going to cost this time?” However, her ideas are always good, and we have implemented several of them. For instance, Michele took the initiative to conduct a class for MK’s to prepare them for their difficult transition to the foreign field. She thought of making a mosaic of the world in front of our new multipurpose building, and that has become a reality. The beautiful missionary posters that are now available at VictoryBaptistPress.com were her idea too! Thank God for people with new ideas! Besides her training at BBTI, Michele is also a graduate of Faith Bible Institute and the intensive medical training EQUIP.